Do you know? you can add pop up calculator for MS Word, by adding this calculator you can do calculation and copy paste the data from calculator to word document, the best thing is that this calculator will open in a single click, so lets see how to add calculator for Microsoft Word. 1. Open google in your desktop search for “pop up calculator for ms word download” and go through with first link, download and install pop calculator, follow the onscreen instruction for installation. 2. 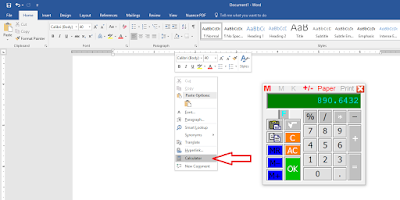 After successfully install, reopen the word document, right click and click on “Calculator” for copy and paste data from calculator press “Ctrl+C” for copy and “Ctrl+V” for paste.